Christmas is definitely my favorite time of year and one of my favorite times to paint. Christmas for me is about the lights on in all the homes and shops, the Christmas carols, the excitement on a child's face, decorating a freshly cut evergreen tree, watching the snow fall, the warmth of friends and family around Christmas dinner, and the spirit of giving that surrounds our favorite holiday traditions. I've tried to capture all of that in this busy little village scene. But the most important part of Christmas is the birth of our Lord and Savior. So many of us are blessed to be able to enjoy all of the festivities that I've mentioned, for others, Christmas is a time of pain loneliness and sorrow. Jesus to give comfort to his hurting children on earth. So as we enjoy all the traditions that make Christmas such a special time of year, let's remember to comfort others and take time to share our joy with them. Then we can discover the true spirit of Christmas and make our joy even greater by loving others. 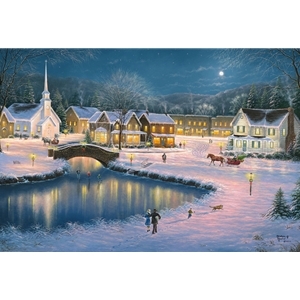 I pray my painting brings you joy and peace and warms your heart in a special way this Christmas season.